May chang essential oil has a sweet, citrus aroma. May chang’s refreshing, stimulating and uplifting aroma is particularly useful for low energy states and may help with relieving lethargy and fatigue. The oil helps to calm the nervous system and may help to clear the mind when feeling nervous, anxious or confused. Because of these properties, may chang is particularly therapeutic in times of stress, especially work-related stress and for those difficult times when you can`t ‘switch off’. The may chang essential oil is extracted from the fruits. This essential oil blends well with geranium, jasmine, lavender, neroli, orange, ylang ylang, rose, petitgrain and rosemary. 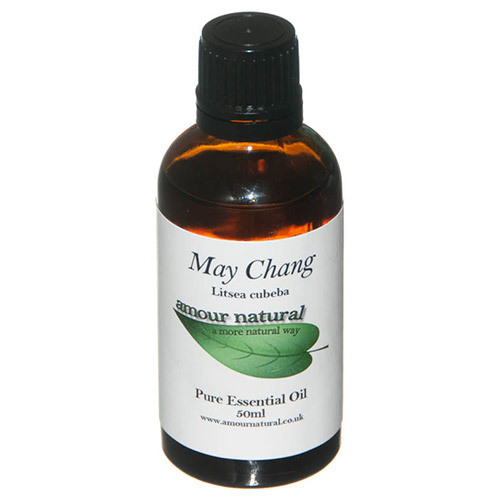 May Chang Pure Essential oil. Below are reviews of Amour Natural May Chang Pure Essential Oil - 100ml by bodykind customers. If you have tried this product we'd love to hear what you think so please leave a review.